We call her Betty. I honestly don’t know how we lived without her. She’s amazing. Sometimes she has some emotional issues…but we still love her. Yes folks, I’m talking about our Garmin Nuvi 350. Roadtrips will never be the same. Before Betty, we would use our Blackberries to get online with Google Maps. This worked great, except when we didn’t have service. Then we were out of luck. Betty is much more advanced. She gets her information from a satellite. 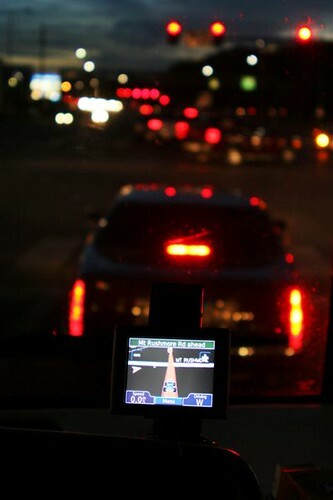 Let’s just say I love the inventor of GPS. Betty can find ANYTHING, it seems. For example, when we are driving down the interstate and need to check on grease possibilites, we just tell her to find restaurants and she lists them in order of distance. If we want Chinese restaurants specifically, she’s glad to refine the list. My favorite search, of course, is for the nearest coffeeshop. Now, if somehow I could just get her to taste test and review each one, that would be perfection. She will calculate our speed while we’re driving, our average speed, total time on the road, moving time, moving average, stopped time, stopped average and overall average. It tells us how many miles we’ve gone and also how many miles until our destination. She also tells us the our estimated time of arrival. These are all very important things, as Matt is the ultimate trip planner. We can also install a language update with translations for French and Spanish (but we won’t be). She’s a very cultured GPS. AND, she’s an MP3 player too. But, like any electronic device, she isn’t perfect. Betty doesn’t really care that we are an RV. In fact, we might as well be a little racecar for all she cares. She will sometimes take us on a route that doesn’t take our HUGENESS into account. She will also take the most direct route…even if it’s not logical. So sometimes we opt for a “Betty Override”. The other little glitch is that development happens so fast that she needs an update every once in awhile so she knows where the new roads, new restaurants,new campgrounds, etc. are located. Bella heard me talking about Betty…so I tried to explain. Me: “Well…she’s a pretend person who helps us while we drive”. Me: “Betty is like a map”.